Daffodils are usually one of the most reliable and cheerful of the signals for spring. Their bright yellow cup-and-saucer blooms brighten up the yard and promise warmer weather to come. If your daffodil buds wither and turn brown without ever blooming, you’ve been a victim of bud blast. 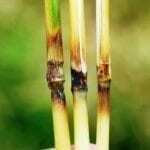 Weather, nutrition and the way you treat the plant all can cause bud blast in daffodils, but most conditions are ones you can remedy for next year. Learn what causes daffodil buds not to open and how to prevent this condition from happening. What is daffodil bud blast? When your daffodil plants look like they’re growing normally, until it’s time for the buds to bloom, and then your daffodil buds don’t open, bud blast has likely gotten to them. Instead of opening up, the daffodil buds wither and brown, never turning into a flower. You’re left with a collection of stems with small, brown buds on the ends. Nutrition – Fertilizer with too much nitrogen tends to encourage healthy plant and leaf production and cuts down on daffodil blooms. Weather – Extreme hot or cold weather after a daffodil blooms can cause bud blast in the next year’s batch of flowers. Planting depth – Daffodil bulbs that are planted in shallow holes are more prone to bud blast. Cutting foliage – Daffodils need time to gather energy in their bulbs after blooming is finished. 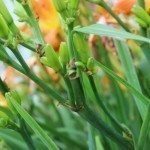 Cutting off spent flowers or leaves too soon can cause bud blast the next year. The way you treat your plants this year has a direct effect on your plants where daffodil buds don’t open next year. Allow the spent flowers to stay on the stem until they are completely brown and withered, then only clip back the stem itself. Allow the leaves to yellow and brown on their own instead of cutting them off. Protect blooming plants from extreme weather with a thick layer of mulch if you expect a late frost and some improvised shade for extra-hot spring days. Dig up daffodil bulbs in the summer once the leaves have completely died and store them in a cool spot. Replant the bulbs in the fall by choosing a spot with full sun and planting them from 6 to 9 inches deep. Feed the bulbs with a low-nitrogen fertilizer and keep the soil moist to encourage root production through the fall. Read more articles about Daffodils.